City Spinach . . .
An evening stroll has long been a healthy habit of mine. Now married, I am happy to know my wife enjoys a constitutional after dinner as well, so most evenings find us wandering together around some part of the West Village. When August arrived, we decided to diverge from the peace and relative solitude of the neighborhood’s residential garden blocks in order to peruse the beginnings of the fall fashion season that were starting to be showcased along Bleecker Street. Then and there began my latest investigation of a West Village wildflower. I was born in August and have always enjoyed this month more than most. The earliest hints of a new autumn season can be perceived. Change, transition, and opportunity emerge as themes. Darkness falls a bit earlier, football talk begins to share air time with the summer pastime of baseball, back-to-school circulars arrive in the mail, and a Dog Days dry season takes hold, which browns the public park grass before the fresh infusion of reinvigorating dampness arrives with the Equinox. The steady heat hangs on as well, although knitted wool earth tones and tweeds start to appear in clothing shop display windows. Such materials blend well with the growing anticipation of the impending harvest season. I have always loved this mix of the urban and the provincial; a kind a rustic sophistication that blends the clear design lines of the city with the textures and colors of the country. 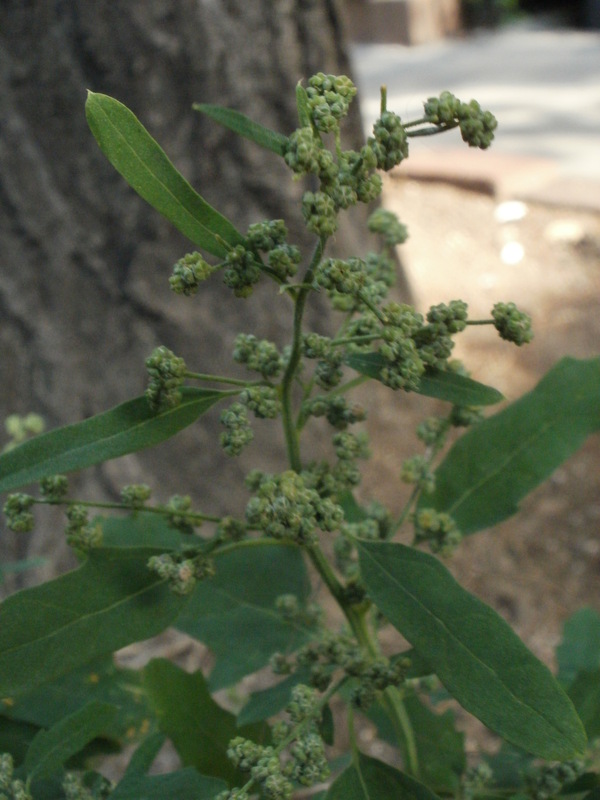 And therein began my latest wildflower study: Lambs Quarters – one of the most common wild plants of the West Village – on the menu in the West Village. Lambs Quarters could just as easily be called “City Spinach” – The leaves are high in iron and cook quickly in a variety of ways like its cultivated counterpart. The main difference between the two is that one is found in gardens and on farms while the other, at least here in America, is most often found sprouting from cracks in the curb. 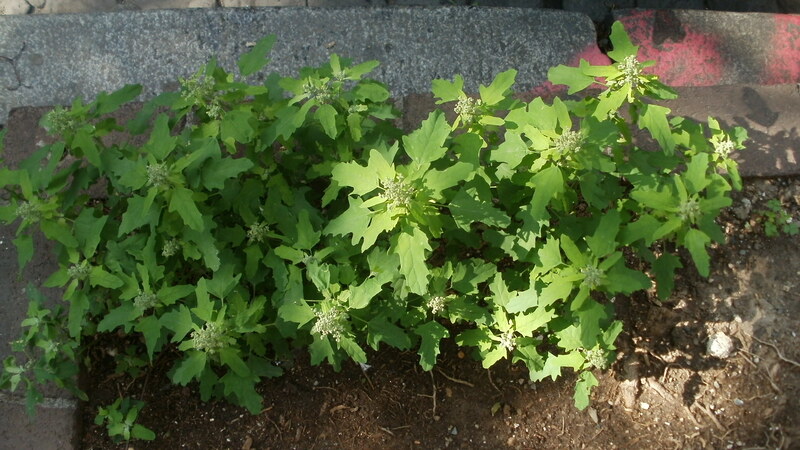 Chenopodium album is an annual European immigrant known in less flattering terms as Goosefoot or Pigweed. Lamb’s Quarter’s is a member of the Goosefoot tribe, so the former is somewhat understandable. The plant is very modest in appearance; its form and overall coloration are more distinctive than its flower. The leaves are shaped like rounded diamonds and reflect gray and bluish tones that resemble cruciferous vegetables like the broccoli and Brussels sprout. Like other members of the family Amaranthaceae, the flowers share the same coloration as the rest of the plant, are individually tiny, and grouped on upright inflorescences that resemble another neighborhood wildflower: the prettier and pink Lady’s Thumb. Lamb’s Quarters is a popular ingredient in Indian cooking, providing the substance in Saag dishes and the stuffing in Paratha breads. Occidental cooking prepares the leaves and stems in the same way as spinach. Whether you prefer a sautéed side dish to your brook trout prepared in a French provincial manner, or simply a nutritious steamed green, this city spinach can sate the appetite of any urban Popeye.